Overtraining may suggest that you are probably training too much, too frequently and with little recovery time. 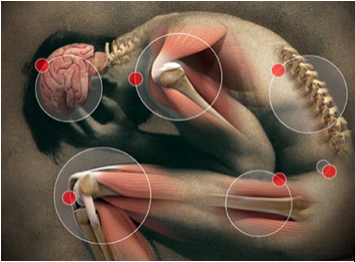 Overtraining Syndrome (OTS) is actually a clinical syndrome and, as you can imagine, is common in athletes. Trust me, I get it. I love climbing and all I think about is climbing. Occassionally having days where I train twice a day (weights and climbing session), and can train up to 5-6 times a week, on top of doing a Masters Degree and having three part time jobs. I can’t help myself. When I was going through a long phase of plateauing, a good friend once asked when my last complete rest day was, when I wasn't doing anything (working, training or studying). I genuinely couldn’t answer. It opened my eyes and made me realise I had to listen to my body. Basedowic Overtraining is where there is an increase in CNS activity, more commonly due to work, family or social life stresses. It reduces rebuilding so the body struggles to recover quickly. This is more prevalent in high intensity activities that require speed, strength and explosiveness. Basedowic overtraining can decrease reaction time and decrease the performance of skilled movements. Addisonic Overtraining occurs due to disruption and malfunctioning to the adrenal and pituitary glands in the brain. This is more common in endurance sports, that are low in intensity but high in volume. You can have a combination of both. As Basedowic tends to be due to more psychological stress and Addisonic is more physical. Constant training and no adequate rest days means the body can't recover quick enough and it won’t adapt. The more someone is conditioned to training the less rest and recovery they need. For example, a professional athlete will only require 1-2 days for recovery a week, whereas a more sedentary person who has just started at the gym with the “new year, new me” mentality, will require more rest days, as their body isn’t conditioned for lots of stress to be placed on it, resulting in over training symptoms and a high possibility of acquiring an injury. What are the Symptoms of Overtraining? Consume dense foods, high in protein. You know your own body. Listen to it. If not, learn to listen to it! Nobody knows your body better than you, if you feel sluggish, tired and struggle to get going, you may be suffering from overtraining. If you have an injury/niggle that just doesn’t seem to be getting better, rest. Your body is trying to tell you to rest and recover. Some medical professionals in sport, suggest recovery is just as important as training. Without recovery, your body won’t adapt and therefore you won’t get stronger. Your body will benefit more from recovering than going and training some more, or going back to the problem you so desperately want to get. When we train we get weaker for a while, then stronger, then return to where we were. 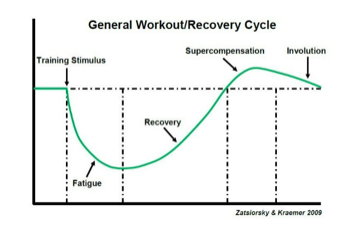 The getting stronger phase is known as the supercompensation phase. This is the best time to have another training session to benefit from the most gains. Then repeat. It also massively increases the risk of an injury. Recently there has been a massive increase in elbow tendonitis in climbing. This could be due to the fact that climbers want to constantly push themselves. Finger injuries are also related to over training, and no-one wants a finger injury! So be sensible if you feel like you're suffering from overtraining, take a day off. For me personally I struggle to rest. I like to go 100mph and forcing myself to rest is hard. As I have climbed all my life and have always been active, I struggle to understand and comprehend how people can sit in front of a TV all day. My rest days normally consist of some stretching, getting university work done, writing blogs and training programs, and more recently some light yoga. I love climbing and I love pushing myself in training. But learn to rest and more importantly listen to your body. I hope this article has been informative and has opened your eyes to taking a bit more time to recover. Who's Afraid of the Big Bad Campus Board?